The control of users and groups is a core element of Fedora system administration. Users can be either people (meaning accounts tied to physical users) or accounts which exist for specific applications to use. Groups are logical expressions of organization, tying users together for a common purpose. Users within a group can read, write, or execute files owned by that group. 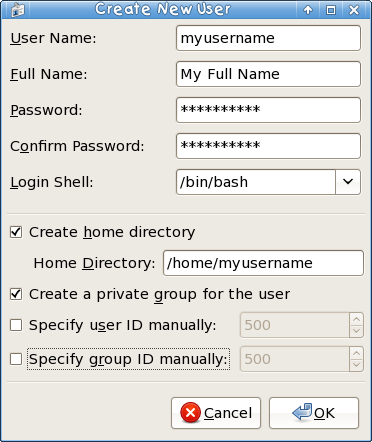 Each user is associated with a unique numerical identification number called a userid (UID); likewise, each group is associated with a groupid (GID). A user who creates a file is also the owner and group owner of that file. The file is assigned separate read, write, and execute permissions for the owner, the group, and everyone else. The file owner can be changed only by the root user, and access permissions can be changed by both the root user and file owner. The User Manager allows you to view, modify, add, and delete local users and groups. You can start the User Manager by clicking System → Administration → Users and Groups. Alternatively, you can enter system-config-users at the shell prompt to open the User Manager. Viewing and modifying user and group information requires superuser privileges. If you are not the superuser when you open the User Manager, it will prompt you for the superuser password. To view a list of local users on the system, click the Users tab. To view a list of local groups on the system, click the Groups tab. To find a specific user or group, type the first few letters of the name in the Search filter field. Press Enter or click the Apply filter button. The filtered list is displayed. To sort the users or groups, click on the column name. The users or groups are sorted according to the value of that column. Fedora reserves user IDs below 500 for system users. By default, the User Manager does not display system users. To view all users, including the system users, go to Edit > Preferences and uncheck Hide system users and groups from the dialog box. To add a new user, click the Add User button. A window as shown in Figure 22.2, “Creating a new user” appears. Type the username and full name for the new user in the appropriate fields. Type the user's password in the Password and Confirm Password fields. The password must be at least six characters. It is advisable to use a much longer password, as this makes it more difficult for an intruder to guess it and access the account without permission. It is also recommended that the password not be based on a dictionary term; use a combination of letters, numbers and special characters. Select a login shell. If you are not sure which shell to select, accept the default value of /bin/bash. The default home directory is /home/<username>/. You can change the home directory that is created for the user, or you can choose not to create the home directory by unselecting Create home directory. If you select to create the home directory, default configuration files are copied from the /etc/skel/ directory into the new home directory. Fedora uses a user private group (UPG) scheme. The UPG scheme does not add or change anything in the standard UNIX way of handling groups; it offers a new convention. Whenever you create a new user, by default, a unique group with the same name as the user is created. If you do not want to create this group, unselect Create a private group for the user. To specify a user ID for the user, select Specify user ID manually. If the option is not selected, the next available user ID above 500 is assigned to the new user. Because Fedora reserves user IDs below 500 for system users, it is not advisable to manually assign user IDs 1-499. To configure more advanced user properties, such as password expiration, modify the user's properties after adding the user. Refer to Section 22.1.2, “Modifying User Properties” for more information. To view the properties of an existing user, click on the Users tab, select the user from the user list, and click Properties from the menu (or choose File > Properties from the pulldown menu). A window similar to Figure 22.3, “User Properties” appears. User Data — Shows the basic user information configured when you added the user. Use this tab to change the user's full name, password, home directory, or login shell. Account Info — Select Enable account expiration if you want the account to expire on a certain date. Enter the date in the provided fields. Select Local password is locked to lock the user account and prevent the user from logging into the system. Password Info — Displays the date that the user's password last changed. To force the user to change passwords after a certain number of days, select Enable password expiration and enter a desired value in the Days before change required: field. The number of days before the user's password expires, the number of days before the user is warned to change passwords, and days before the account becomes inactive can also be changed. Groups — Allows you to view and configure the Primary Group of the user, as well as other groups that you want the user to be a member of. To add a new user group, click the Add Group button. A window similar to Figure 22.4, “New Group” appears. Type the name of the new group to create. To specify a group ID for the new group, select Specify group ID manually and select the GID. Note that Fedora also reserves group IDs lower than 500 for system groups. Click OK to create the group. The new group appears in the group list. To view the properties of an existing group, select the group from the group list and click Properties from the menu (or choose File > Properties from the pulldown menu). A window similar to Figure 22.5, “Group Properties” appears. The Group Users tab displays which users are members of the group. Use this tab to add or remove users from the group. Click OK to save your changes.